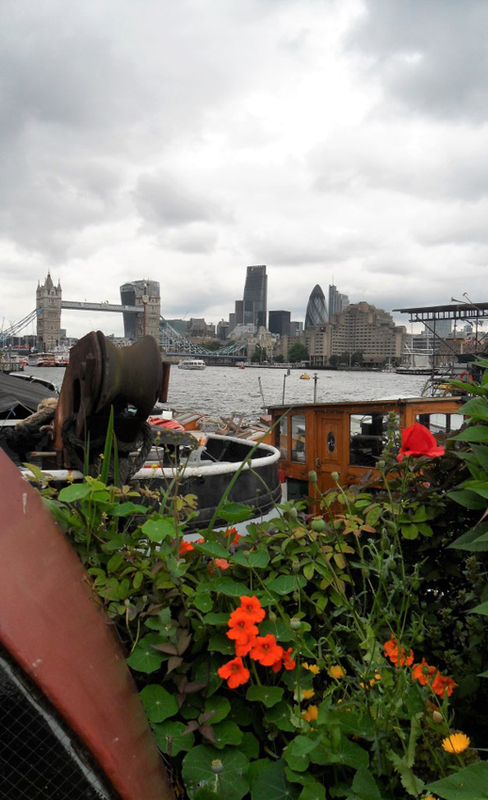 Hello – Rosanna Cavallo here again with the Green Arts as they happen in South East London. June can be a gloriously sunny month and we have had plenty of sun. 2017 has also seen June gale force winds in the South East – believe it or not some of my clients have had their rose bushes blown clean out of the ground. This month is also the month of beautiful blooms. Take the banner heading picture above for example – these are the gorgeous double flowers of Clematis Vyvyan Pennell which puts on a show like this in late May/early June. Then it performs for the second time later in the year with a second flowering, this time of single blooms. This outstanding Clematis truly repays the extra time and effort spent giving it TLC. 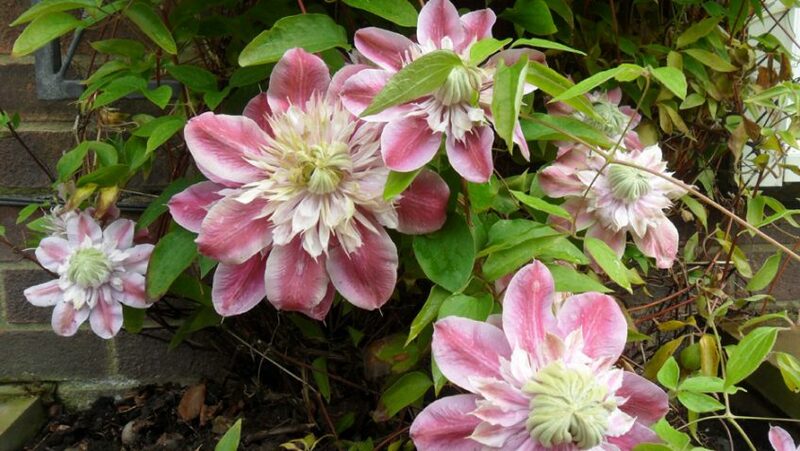 On the topic of giving TLC to plants I would just mention that, when buying new Clematis plants, be sure to give them time to establish in your own garden. 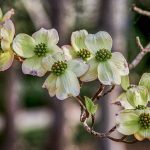 It may be three seasons before you get exactly the shape of climber you want and, in that period, careful and regular watering is important with the roots in the shade. Nurseries tape up climbing plants for sale otherwise they would climb over every other plant nearby on the sale display – once planted in your own garden these tapes should be removed. Climbers like Clematis are perfect for the smaller garden and function in two ways – they can clothe the boundaries of fence or wall and mask where the garden begins and ends, secondly they provide colour – there is one flowering almost every month of the year – and only taking up a handful of centimetres of your precious flower beds space. June may be the month of flowers but there have been several additional happenings in my garden world. A very unexpected sight . . .
Last June, walking through one of the most built-up urban areas of South East London on my way to shopping for groceries I was halted by this very unexpected sight. This magnificent specimen was seen in a front garden. I had never seen one before and I had to take a picture. I remember thinking, given that I am not knowledgeable about Fungi, I would probably never find out what it was. But in a completely different context a couple of months ago I was lucky enough to meet a Fungus expert. I seized the day and asked if I might send a picture for her to identify. She made a disclaimer – it is always difficult to identify anything from a photo – but she said she would have a go. She did a lot better than that. She knew it well and gave quite a lot of info. 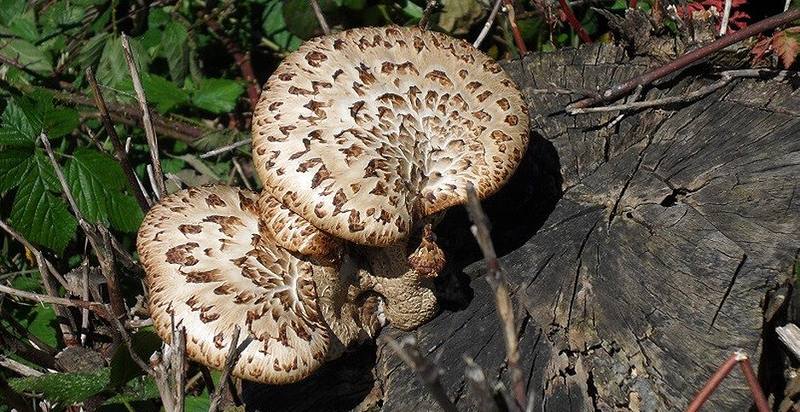 This is Dryad’s Saddle – botanical name Polyporus squamosus. It grows, apparently, on deciduous trees – stumps or trees that have been damaged – and is unusual in appearing in late spring/early summer unlike most Fungi usually found fruiting in the autumn. She asked me had I noticed the fact that the stalk was on one side rather than in the middle. I had, but assumed it was damaged. Not so, this feature of having the stalk on one side instead of in the centre like most mushrooms is, I imagine, what give it its common name. It was not a rare find, however, it seems Dryad’s Saddle is not that uncommon. 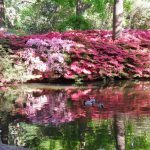 Regular readers will know that from time to time I mention local people who are doing something I find notable with a horticulture or gardening focus. One resident in my neighbourhood, known to be a keen gardener herself who, at one stage, was adventurous enough to keep chickens in her garden, started her “Wall” some years ago with just a few plants. As you can see there is now a large variety of plants for sale. It all started when someone very close to her was helped at the local Hospice. 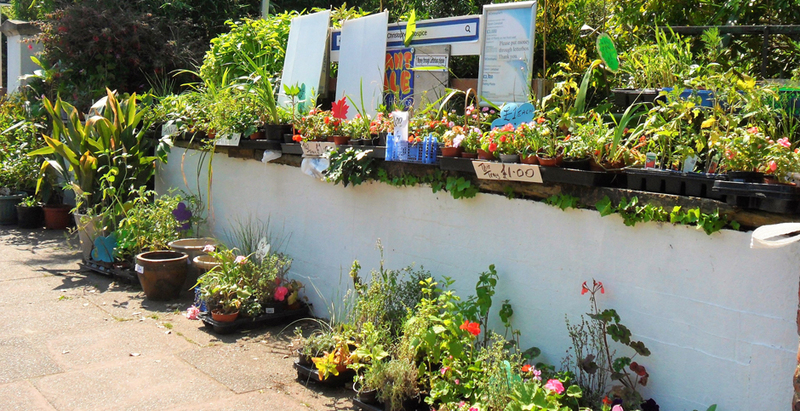 She then began to raise funds for the Hospice by producing and selling plants on permanent display in her front garden. The project quickly gathered momentum as local people started to generously donate plants, pots etc to augment her own plants. The “Wall”, and most of the garden, as you can see is now literally covered with plants for sale and she has made thousands of pounds for the Hospice in this way. For collecting money when she is not there she has established an honesty box system. It really works – people are trusted to pay and they do. The plants are realistically priced and sell out quickly. I wanted a winter jasmine (very first flowers of the year) and I have been very pleased with one I bought from the “Wall” which is doing well. Congratulations to that lady and her “Wall”. Lasagne bed, now with greedy occupants. A couple of months ago I wrote about my Lasagne bed experiment at the allotment. 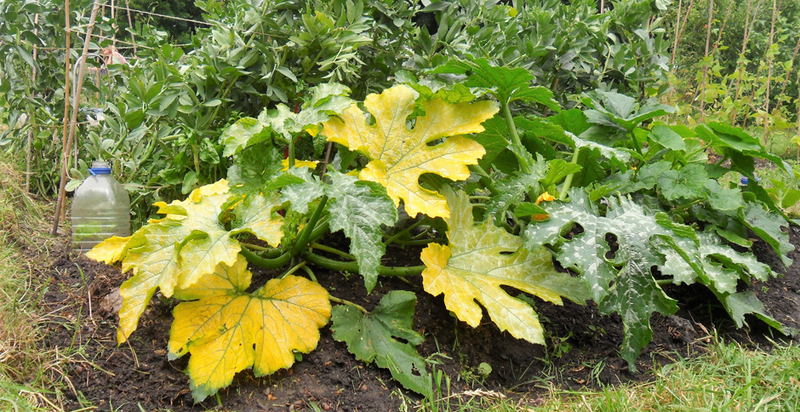 As you can see the extra nutrients in the many layers have made “the greedy feeders” very happy and they are growing strongly – they being, yellow courgette, green courgette, marrow and a heritage butternut squash which went in later than the others and as yet is a little on the frail side. I’d call this a successful experiment and I now intend to put in at least one of these Lasagne beds each year thereby creating pockets of fertility on the plot. Hopefully, I will be getting a regular supply of cardboard from local shops. 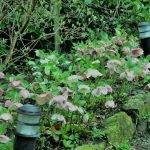 The fertility of the soil is especially important for the needs of vegetables, however, even if your garden is ornamentals only it is always wise, indeed necessary, to replenish the soil that is constantly being drained of nutrients by plants. I am a great believer in the compost heap – all the weeds (once dried), all the non-meat kitchen waste and all the shredded paper go in. The resulting compost is barely enough for a small garden once it has rotted down. Some people worry that a compost heap would smell. It doesn’t. I think the Lasagne beds and the compost heap should give me a really good level of fertility in my soil in future. What do you make of the above picture? Craggy trunk of a tree? A mouldering pineapple? It is neither of these but is not a sight usually seen by most of us town dwellers and seems to be another June happening. 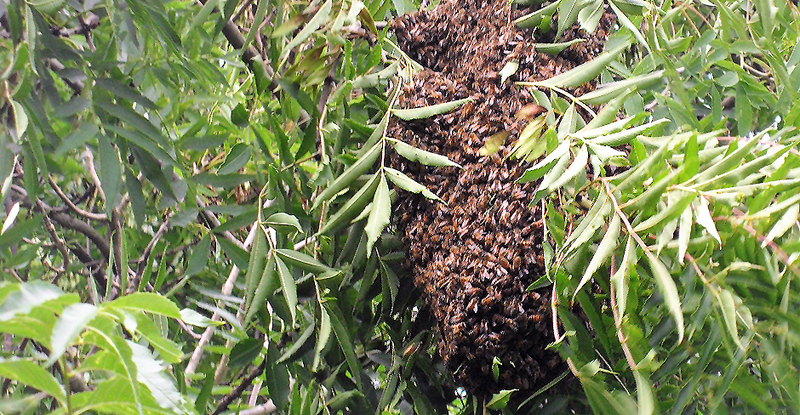 This is actually a bee swarm – thousands of bees clustering around the queen to protect her. This happens from time to time at my allotment site where there are a number of beekeepers – I believe that the bee populations of the hives divide now and then and go off to start anew somewhere else. This swarm belonged to one of the beekeepers and I understand he came along, cut down the branch and put the swarm in a box and took it away. Not before one of them got caught up in my hair and seemed reluctant to come out – which involved a lot of shouting by me and eventually pouring a watering can over my head until two people came to my rescue and removed offending bee. In all seriousness though I have never been worried by having bees on the site – they are well looked after by the beekeepers. I’ll leave you this month with some sights I found very encouraging on the greening of the City. Floating gardens too . . . 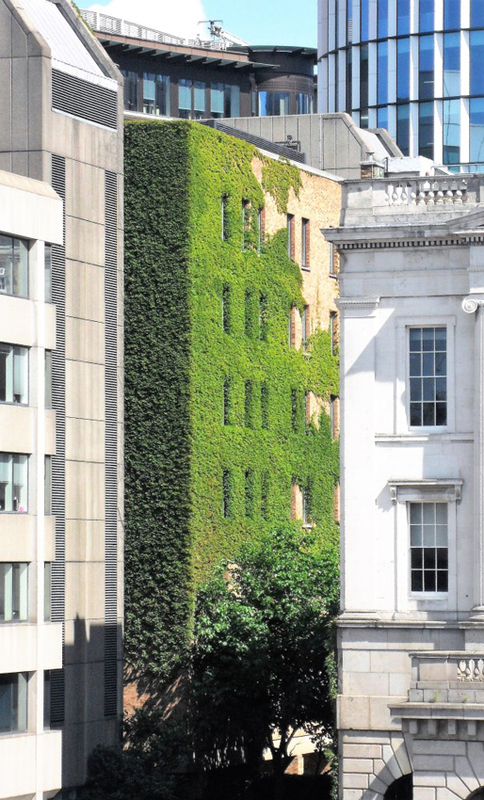 I love the look of these vertical plant walls and, although in some quarters there is understandable dissent about the amount of water needed to sustain them, perhaps this should be balanced by their anti-air-pollution role? 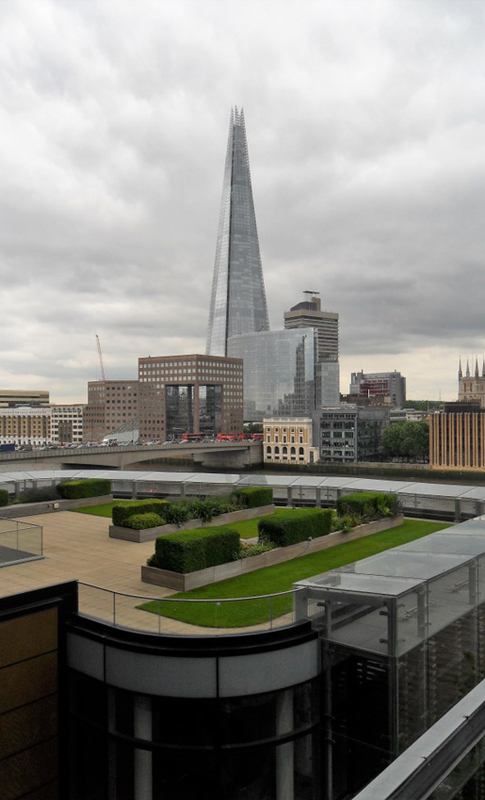 Roof gardens are on the increase on corporate buildings – giving the occupants a peaceful place to relax and recover from stress for a while and, of course, again playing a role in purifying the air we breathe. Even people living on board feel the need to be surrounded by plants – and why not. This marina has floating decks with a delightful abundance of plant life. Cheerio until next time. Happy gardening (and composting).